Kobo is one of the world’s fastest-growing eReading services, offering more than 4 million eBooks and magazines to millions of users across the world. It is their mission to empower book lovers to read more. 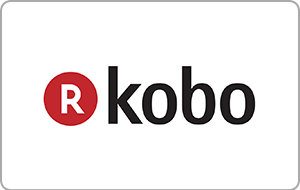 Kobo delivers the best digital reading experience, offering one of the world's largest catalogues with millions of titles, award-winning eReaders and top-ranking apps. Give a Kobo gift card to fanatical readers and give them access to millions of eBooks, magazines, kids content, comics and more, dozens of genres in 77 languages and let them enjoy synced bookmarks across devices with the FREE Kobo App!